This is the famous Dawsonville poolhall and the fan base home of ''Awesome Bill'' from Dawsonville. This car was very different from the flathead Ford motors of yesteryear. 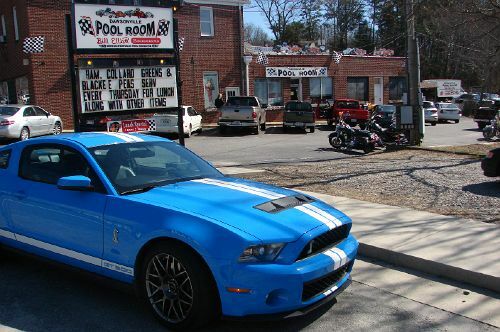 The 2011 Shelby GT500 would have a hard time toting moonshine because there isn't much room in the trunk. What was funny is the fact that my wife was having some mobility problems and was using a walker for a short time. We got a few laughs roaring up in a GT500, opening the trunk and taking out the walker to go in an have a burger.